Book the 2017/2018 Antarctica Express Fly Cruises on the Ocean Nova and Hebridean Sky and get $1000 air credit. 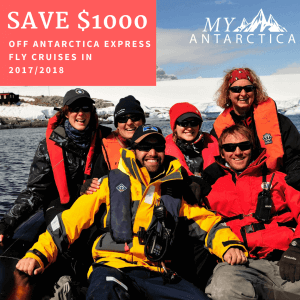 Book and pay deposit for specific 6 Day Antarctica Express Cruises by the 15th of March and each traveller will receive US$1000 off the regular price that you can use towards your flights to South America. Save time reaching Antarctica by flying one portion of your journey over the Drake Passage. Explore the South Shetland Islands and Cruise Antarctica on a unique 6 Day expedition voyage onboard the Ocean Nova and Hebridean sky vessels. Led by expert guides, your Antarctica adventure includes landings on Antarctica, zodiac rides to visit notable sites like penguin colonies, exploring Antarctic bases and learning about the gorgeous wildlife such as seabirds and marine mammals through a comprehensive lecture program as well as seeing them firsthand. Triple cabins will start at US$3,695 and twin accommodation at US$4,695 per person. Single travellers can request to share with travellers of the same gender. With some great sales for South America airfares going around, this is a unique chance to get an introduction to Antarctica at an unbeatable rate.